At the beginning of the year, I made a goal to read the cleaning book of all cleaning books, Home Comforts by Cheryl Mendelson. Clocking in at nearly 1000 pages, I was pretty sure it would solve all of my cleaning woes. But after reading the first one hundred pages and feeling distinctly more depressed than inspired and realizing it was going to take me another fifty hours of my life to finish reading about how we needed to use two forks, a cloth napkin, and the second best china at every meal, I made the conscientious decision to abandon it. But I couldn't abandon the goal--and not just because abandoning a goal would go against my very nature. I needed real help, something that would alleviate the daily chaos that is my current life. 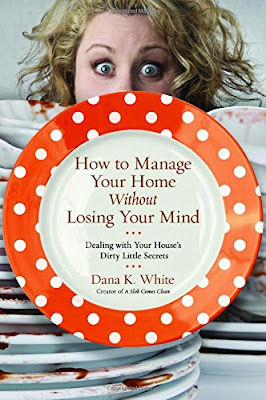 A couple of weeks later, I happened to read this post where Torrie briefly mentioned the book, How to Manage Your Home Without Losing Your Mind, and I thought, That sounds helpful, and then I saw the cover (<---), and I knew I'd landed on the right book at the right time. When Dana White began her blog, A Slob Comes Clean, she did so under the pen name Nony (short for Anonymous) because who wants to actually admit that they're a slob? But over time, she came to own it for what it was and, more importantly, overcome it. Her secret was two-fold: She implemented little non-negotiable routines into her day, and she relentlessly purged her stuff. I loved this book--not only because it gave me the hope and the tools to improve my life but also because it didn't completely pulverize my self-esteem the way the other cleaning book had. In fact, as I started reading, I realized maybe I wasn't such a bad housekeeper after all. Dana's first suggestion was to do the dishes. Just do the dishes right now. And then do them the next day. And the day after that. No matter what other catastrophes are going on in your house, just do the dishes every day. But guess what? I already do the dishes every day. It is rare for them to ever pile up into a heap so daunting I'd rather throw them all away and start over than bring myself to tackle them. In fact, I don't know if I've ever confronted a dishes problem like the one Dana described in this book. But the point isn't actually doing the dishes. In Dana's words, "If your dishes are always clean, don't switch to my method of doing them. Choose something that's a problem in your own home." And immediately, I knew what that was for me: clearing and wiping down the table and counters in the morning. It is something that is so simple (probably too simple since it seems like other things always take priority over it), but it makes a huge difference to my mental health to get home from school drop off and walk into a kitchen with clean counter tops. It's not that it was a problem of the magnitude Dana was describing, but when my kitchen counters stay crumb-ridden throughout the day, it colors my whole attitude toward myself and my house. And it only takes me five minutes to wipe down everything. Five minutes! My sanity is worth five minutes. So that was one routine I immediately added to my morning schedule. But I think reading this book made me realize that while my house often looks like a slob (actually, seven slobs) lives here, I am not a slob at heart. If I lived by myself, I would not be a slob. And I have proof of this. As a freshman in college, my roommate and I were both very tidy. We made our beds every day. We kept our desks clear and organized. We did our laundry promptly, long before we ran out of clean underwear, and our floor was never strewn with cast off clothes. Our tiny dorm room was a haven, and friends would actually stop by just so they could enjoy being in a clean space for a few minutes. That's what I'm like when I live alone. But having five kids has changed me. In the last three years especially, it has felt nearly impossible to stay on top of the chores and the messes and clutter. In fact, the only time my house stays clean is when I follow my kids around, quietly straightening and cleaning in their wake. But, believe it or not, this is not how I want to spend every waking minute of my day. Dana is quick to point out that you can't blame your family for your messy house. It's unfair for me to say, "I'm not a slob! It's my kids!" Especially since my bedroom is often just as messy as theirs (but of course, I have my totally legitimate excuses). I think my point is just that it was somewhat validating to read this book and realize, "Oh yeah, I gravitate toward good routines that produce a clean environment." The problem is I think I've been trying to do things the same way I did when we were a much smaller family. I haven't changed and tweaked our routines as much as I should have to fit with our new family dynamic. Case in point: the laundry. My arch nemesis. The bane of my existence. It seems we always have a million baskets scattered around the house: dirty laundry waiting to be washed, clean laundry waiting to be folded, with no end. Ever. When Dana started in on the laundry chapters, I could feel myself zoning out because she was pushing for a Laundry Day. That's not a new idea, and it's something I'd already considered and rejected several times. A Laundry Day just wouldn't work for our family because we have so. much. laundry. The thought of a week's worth of dirty laundry literally made me feel sick. But then she said something like, "Depending on the size of your family, you may have to have more than one Laundry Day," and it was like the light flashed on and I thought, I can have two Laundry Days? Is that allowed? And suddenly, I could see exactly how Laundry Day could work for our family. I realized that the beauty of Laundry Day was that it had a beginning and an end with a blessed break in the middle. And whether that was all of the laundry on Monday or all of the laundry on Tuesday and then again on Friday, it would still have the same benefits. It's too soon to tell for sure, but this has felt like one of the easiest routines I've ever implemented, and so I'm hopeful that means it will stick. Maybe this book is full of genius information (Slob Vision, Dirty Dishes Math, and the Clutter Threshold are revolutionary ideas, I'm sure), but maybe, just maybe, this was the right book for me to read right now. It was simple, repetitive, and funny, but mostly it was just so so realistic. Rather than talking down to me, I felt like Dana was in my corner, lamenting and commiserating but also cheering me on. I can do this! I can make changes and set up routines and get rid of stuff so we can live a happier, lighter life. I still don't know how to fold a fitted sheet (one of the things I was hoping to learn from Home Comforts), but I know how to stay on top of the laundry. And that's a big win. Hey! I'm so glad you loved this book, too! (Although it sounds like you were waaaaaaaay better off than I was to start off with, ha ha!). My mom actually always did two laundry days--Tuesday and Friday--and she left it up to us to sort our clothes once we were old enough. Seeing as there were six of us plus my parents, I can only imagine how much laundry she always was doing! But like you said, it only ever happened on those two days, so she got a break the rest of the week. This book was so funny that I wanted to read it, even if it was about having a cleaning routine. I love how Dana broke it down into babysteps..that made doing it easier and doable. It doesn't take very long to see results and she is so very encouraging and hilarious along the way. Highly recommended! I'm just finishing up the book! Like you, I had a hard time keeping the library copy... This is my fourth time with it :). Also like you, as I read I realized that in general, I'm not as bad off as Dana was, but I have quickly benefitted from adopting some of her principles. Thanks for the recommendation!